"A light and airy favorite bread treat. Serve piping hot and enjoy!" Preheat oven to 450 degrees F (230 degrees C). Grease and flour six 6-ounce custard cups. In a medium bowl beat eggs slightly, Beat in flour, milk and salt until just smooth; being careful not to overbeat. Fill custard cups 1/2 full. Bake at 450 degrees F (230 degrees C) for 20 minutes. Decrease oven temperature to 350 degrees F (175 degrees C) and bake for 20 minutes more. Immediately remove from cups and serve piping hot. 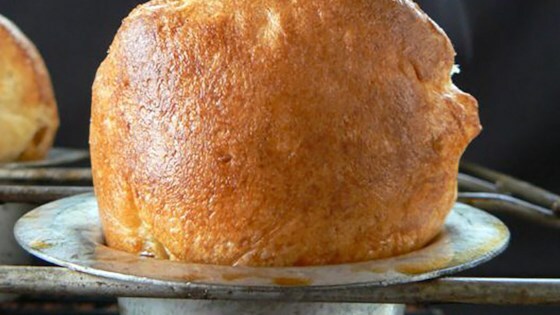 See how to make light and airy popovers with a crispy crust. Recipe was good, but not as good as others I've tried.